One of the most requested new features to the desktop app has been the addition of file sharing. We’ve listened and file sharing is now available in the current version of the desktop app. There is nothing you’ll need to do to have access to the file sharing it will just be there the next time you run the desktop app. The most obvious change you’ll see is the the big “Share” button on the right side of the menu bar which will allow you to select files for sharing via what used to be called our “give” feature. 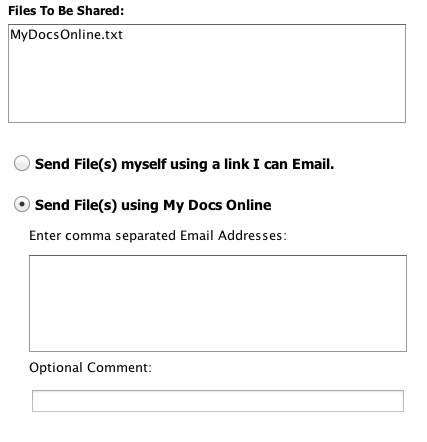 Just select the files, click share and you’ll be presented with two different options. We’ve also added public folder functionality to the Desktop App. Any file stored in your Public folder can be right clicked and you’ll see a menu item called “Show Public URL”. Selecting that option will get you a link to that specific file that can be posted in an email message, or a website, or one of your social media sites. That public folder link will continue to work until you remove or rename the file the link points to. Thanks for requesting these new features. We hope you’ll find them useful.